002.Perrin, Natalie – JavaMuseum 2010 – Celebrate! 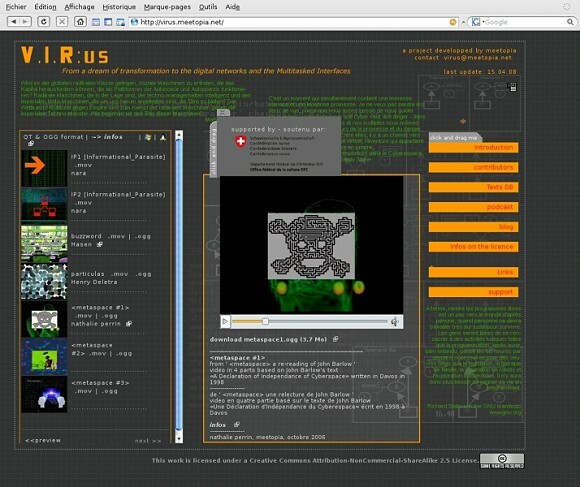 V.I.R:us is a collaborative project on technological and social utopias. It is an internet plateform hosting video streaming, blog, podcast and a database of texts. People are invited to participate by sending videos or audio episodes. V.I:R:us wants to be a platform of polyphonic narratives, little fragments like vectors which re-play and re-stage the positions of the digital utopias; a response to the one-sided project of the empire and it’s One Media Tube. At the beginning of the 90’s, a new culture is developping embodied in the technological improvements of the digital . The old world based on the ideology of the cold war, and the analogical order is ending. Digital networks spread throughout the world producing new forms of connection and communication. New spaces, new landscapes new forms of utopias have emerged drawing a new mental horizon for a new humanity. After September 11 01, opened spaces have been shut down. The power belongs to those who hold information and its broadcasting. The campaigns of a world «against Terror», the application of repressive laws on copyrighted patents have targeted the digital networks as a threat to property, social order, and wellfare. The One Media Tube of ‘happy’ consumption restore the traditionnal gap between those who own and provide contents and those who pay the right to access them . But in the same time, the digital utopias update the canvas of the Revolution; We enter a new era with a high level of connectivity, new social places and new forms of esthetics. 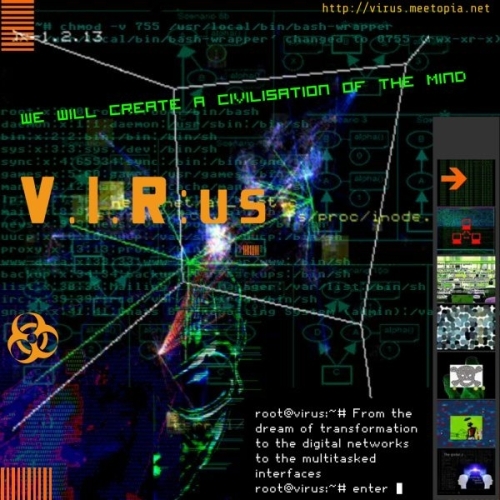 It has federated among others, the free software and hackers movements, the worldwide civil fronts of the late 90’s. In the digital era, the hope for a new world, a better world is reactivated.